At the age of five this musical wonder kid was placed under the tutelage of Shri Swapan Shiva, celebrated artiste and teacher of the Farukhabad Tabla Gharana. Since then he has been dedicating himself to the study of tabla, successfully absorbing material from maestros belonging to other Gharanas and traditions of tabla playing. He received awards in his early age from celebrities like Satyajit Ray, Pandit Ravi Shankar and the President of India in 1987. Training in vocal music from his childhood made him a competent singer as well as a sensitive and sympathetic tabla accompanist. 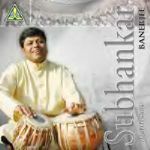 In addition to being a reputed soloist, Subhankar is one of the most popular accompanists for many of the prominent musical celebrities of India including Pt. Hariprasad Chaurasia, Pt. Ravi Shankar and Pt. Shivkumar Sharma. Over the last twenty years he has maintained a highly demanding schedule, annually clocking up thousands of miles and reaching all corners of the globe. Amongst Subhankar Bannerjee's most celebrated performances have been those at the Fiftieth Anniversary celebrations of Pakistan and the Nobel Peace Prize Awards in Oslo.